In a farm system loaded with arms, Bryse Wilson continues to find a way to shine. The Braves' No. 13 prospect spun five one-hit innings, striking out five without issuing a walk, as Class A Advanced Florida topped Palm Beach, 3-1, on Sunday at Roger Dean Chevrolet Stadium. "I was able to establish the fastball early and command all of my pitches in all counts," he said. "I felt really comfortable up there with all my pitches, and I had full confidence in my defense behind me as well." With the same pitch count as his Florida State League debut on Tuesday, Wilson (1-0) was efficient enough to go 1 1/3 frames deeper. The 20-year-old got things started with back-to-back punchouts. The only hit Wilson allowed was a two-out double in the second by Andy Young. The North Carolina native showed no signs of nerves as he struck out the next batter on three pitches to get out of the jam. In the fourth, Evan Mendoza reached on a throwing error by shortstop Omar Obregon, but Wilson got Johan Mieses to ground into a double play as the right-hander went on to face one over the minimum. "[Young] hit a good pitch, so I wasn't too upset with myself," Wilson said. "But I just stepped off the mound, refocused and went right after the next hitter." In what is considered by many to be the top farm system pitching-wise, Wilson sits as the No. 10 arm in the Braves organization. The 6-foot-1 hurler set himself apart last season by leading Atlanta Minor Leaguers with a 2.50 ERA in 26 starts for Class A Rome. He also placed third with 10 wins (10) and fifth with 139 strikeouts. "I just try to go out every outing and do the best that I can," Wilson said. "All of the guys are great guys and we all get along great and push each other. I just try to perform the best I can and everything else is out of my hands." 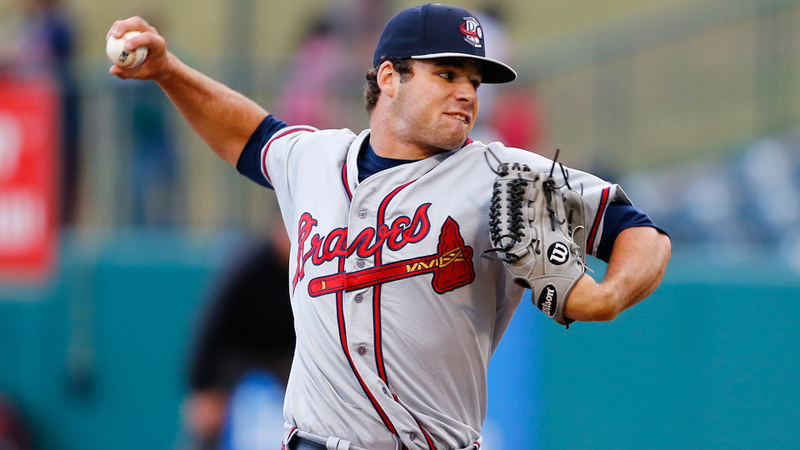 Wilson's start came on the heels of almost identical performances by Braves No. 10 prospect Joey Wentz and fifth-ranked Ian Anderson. Wentz gave up one hit over five scoreless innings on Friday, while Anderson did the same on Saturday. Reliever Devan Watts struck out one in a perfect ninth for the save on Sunday. Braves prospect Jordan Rodgers powered the Fire Frogs with his first Florida State League homer, a two-run blast in the sixth. Ninth-ranked Cristian Pache collected a hit and exited in the sixth, but Wilson said he is "perfectly healthy."